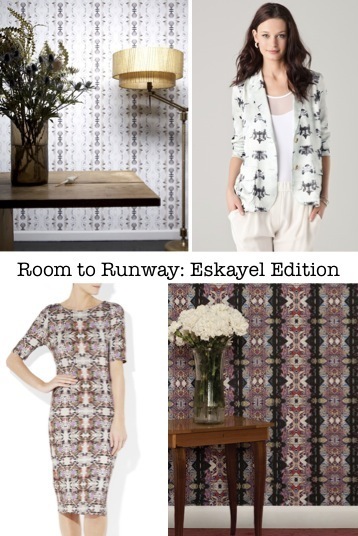 I've had a love affair with Eskayel's unique wallpaper prints for quite some time (past blog post here), and to my delight ready-to-wear fashions burst onto the scene with similar abstract mirrored prints this spring. Eskayel's Bali Stripe wallpaper is subtle and cool, just like Kaelen's print blazer. When paired with simple furnishings and clothing, both patterns are able to make a statement without being obnoxious. Although it may look abstract, this body con jersey dress from Erdem is actually scattered with hummingbirds and florals. Next to Eskayel's mysterious Crown Jewels wallpaper you can really see the sophistication that these type of delicate and intricate mirrored patterns exude. Great comparisons between home and fashion! The prints were great. It looks good on the dresses. I love the print of the dress! it's would be great if you could check out my blog and follow me back if you like it! What an inspired idea! Love it. I remember you that i've nominated you to a versatile blogger award more info on my blog. These prints are totally rad - They are dead ringers for their respective wallpapers! Love that dress! Gorgeous! I am your newest follower. Would love for you stop by The Jem Journal and say hi! That jacket is amazing, I love it so much. That bodycon dress by Erdem is absolutely gorgeous!! Nice post! I love Eskayel! That Bali stripe wallpaper is gorgeous - you did awesome finding that blazer to match! I love it paired with a white blouse and pants. Hello my lovely, thanks for stopping by my blog and for your lovely comment. I have totally fallen in love with your sassy style and sasstastic blog. Well done you, it's so much harder than it looks and you're killing it!! This post is such an original concept, it works brilliantly.